Many voices today call for a profound rethinking of European identity. If we wish to answer their call, however, it is necessary to start with a reconsideration of the notion of boundaries, particularly as they are at work in the Mediterranean region. The knowledge and cultural values of the Mediterranean may be the driving force able to overcome the impasse from which Europe seems unable to free itself. This volume focuses on the opportunity to employ Mediterranean knowledge and cultural values as a stimulus for the review of European policies, in the interest of creating a solid bridge between different cultural legacies and over the daunting challenges of our shared future. This means being able to stay – simul – outside and inside the borders, within and beyond the “un”- limit; looking for an image of Europe which finally stops thinking about the Mediterranean as its internal vulnus, as its lesion and contamination. This volume suggests how it is possible to think both inside and outside of borders, combining the ‘foreign’ forces of promiscuity, exchange, latency, expectancy and hope, with a ‘domestic’ circulation of thought and knowledge, in the interest of a defense of all cultures and of an egalitarian recognition of the right to dignity. Greg Bird is Assistant Professor in the Department of Sociology, Wilfrid Laurier University, Canada. He specializes in continental, social and political philosophy, and biopolitics. Daniela Calabrò is Associate Professor of Theoretical Philosophy at the University of Salerno, where she also teaches Theoretical Philosophy and Philosophical Theories of Mind-Body Relation. Dario Giugliano is Professor of Aesthetics at the Academy of Fine Arts in Naples. His research area includes contemporary philosophy, visual arts and the relations between political economy and aesthetics. The Mediterranean Between Myths, Religions and Philosophy. Imago Europae/Vulnus Mediterranei. A dialogue with Plato, Husserl, Camus, Nancy. The Silence of Sirens. Gilbert Murray and Rudolf Borchardt: constellations of myth and enlightenment in late modernity. The Bounds of Hospitality (Kant-Derrida). Philosophy beyond Border. 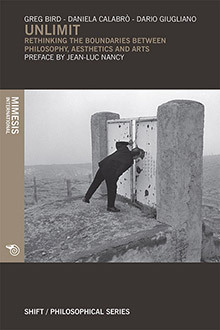 Lévinas, Blanchot, Nancy. On the‘Encroachment’ of theWord in Maurice Blanchot. Borderland. Europe at the Limit. From European Union to the Community Euro-Mediterranean. Some Preliminary Remarks on a Mediterranean Geopolitical Aesthetics. From Internationalisation to Creolization. The path to world literature. From Geographical to Conceptual Boundaries.‘Ugliness’ and ‘evil’ in a history of allegorical images. Migrations of Artists and Cultural Influences in the Renaissance Sicily: the example of Messina between the second and third decades of the sixteenth century.